Yesterday, I talked about the difference between persuasion and manipulation. Today, let's talk about the difference between persuasion and coercion. Coercion is defined as forcing someone to do something against their will. But where is the line between forcing someone to act against their will and persuading them to do something they'd rather not? In other words, when someone chooses "the lesser of two evils", have they been coerced? As a parent, one of your main jobs is "persuading" your children to make choices that will enable them to survive :-) till they're old enough to be on their own. That includes avoiding unsafe activities, putting in the work required to learn things they need to learn, refraining from starving the entire family to death by blowing your food budget on text messaging, etc. What are some of the means of persuasion parents use? The first few obviously fall in the "persuasion" column. The last obviously falls under "coercion". But where exactly is the line? Let's get back to marketing. With threats of withholding, the key question is, what do you have the responsibility to provide the other person. "You can't have the product unless you pay for it." Persuasion. "You can't have the product you already bought unless you buy this other product (that we didn't tell you was a required purchase)." Coercion. "You can't have the product unless you pay a ridiculous amount for it." Persuasion! (Scummy, and likely to be ineffective, but it's not coercion, because the prospect doesn't have to buy). "We won't fix the product for you unless you pay a ridiculous amount." Persuasion. "We won't allow anyone to fix the product for you unless you pay a ridiculous amount." If they actually have the power to deny service, coercion. Otherwise, slimy persuasion -- for example, if a company won't allow authorized service personnel to repair a product for less than a specific price. You can always get someone else to do it, but the risk of their not being qualified may be greater. Do parents have the right to spank their children? We're not going to resolve that question here! If spanking is an effective way to teach a child something more significant than what they suffer, and if there's not a better option available, then I'd say yes -- absolutely. But I'm not going to try to prove that either of those is the case (though I'll say I think there are usually better methods). Parents have a responsibility to teach and guide their children. And with the responsibility comes the authority to choose, within reason, how to do it. What active responsibilities do companies have to society? Not many. Mostly they're responsible to refrain from causing harm, a.k.a. "externalities". So they don't have the authority to threaten action against third parties. "If you don't pay for protection against thugs...well, you know what'll happen (our thugs will break your legs)." Coercion. "If you don't pay up, we'll DDoS your website." Coercion. "If you don't write a positive review of our product, we'll release embarrassing pictures of you." Coercion. "If you drive too fast, we'll fine you or take away your drivers license." Persuasion. People, through representative governments, have legitimate authority to regulate activities that have a high probability of "negative externalities" -- ie. harming others. To put it simply, when someone influences the actions of others by doing things within their own authority and without shirking their responsibilities, that's persuasion. When they influence by violating the rights of others or failing to fulfill their responsibilities (or threatening to do so), that's coercion. Let's look at the definition of coercion again -- forcing someone to do something against their will. Is charging a high price for a product that's not required coercion? Flip the question around. Is forcing a company to sell a product that they're not required to sell for a low price coercion. Yes. So how could their refusing to sell for a low price be coercion? Bad marketing? Maybe. But not coercion. The customer can act according to their own will in deciding whether or not to accept your offer. I'm guessing a few people still won't be convinced, so here's one more way to look at it. Should I be able to walk up to someone in a parking lot and force them to sell me their car for the Blue Book price? No. They have the right to refuse to sell unless I offer a price high enough that they decide it's worth selling. And it doesn't make a lick of difference that Blue Book is a "fair price". The price they're willing to accept is up to them. Companies also have the right to choose the price they're willing to sell for, even if it's so high that no customers will choose to buy from them. 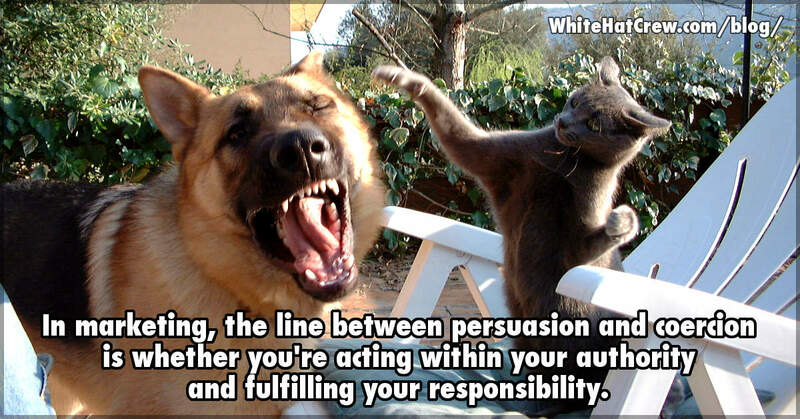 The line between persuasion and coercion is whether you're acting within your authority and fulfilling your responsibility.